If you remember something, does it mean that it’s over, in the past? Or does the act of remembering extend that thing’s lifespan, even resurrect it, lend it new meaning? For those of us who experienced Occupy Wall Street, will it ever be over? In Liberty Square, people mic-checked and recounted the confusion of the General Assembly, the constant fear of police brutality and raids, the various issues with local business (the food vendors), and other ups and downs of the days of the occupation. 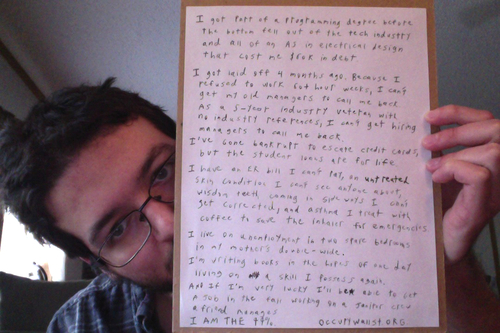 One woman told of how Occupy had saved her, when she was on the verge of suicide from being chronically depressed about her financial debt and family issues. Through remembering Occupy on its anniversary, people made it so that Occupy was not dead, rather it was a 2-year-old baby, still learning to walk, somewhat naive about the world. While such stories were being shared in the park, tourist gawked, rebellious Occupiers yelled rudely and waved anti-Occupy flags, and police stood guard with bored faces. Some things never change. Strike Debt Reports: Who Pays for Sandy? Strike Debt, an Occupy affiliate, just came out with a very well-researched and thorough report on the aftermath of Hurricane Sandy, called “Who Pays for Sandy?” Now, not only is Occupy Sandy one of the main organizations providing relief to communities wrecked by the hurricane, but Strike Debt is one of the leading think tanks working on the issue! Below are some of their main, and quite dismal, findings. The economic costs of the disaster are placed on individuals. Federal aid programs require victims to first apply for loans before qualifying to apply for FEMA aid. “Aid” programs favor those who can take on debt. Preexisting inequalities are further exacerbated by this form of aid. Federal programs are inflexible and fail to meet even basic needs of affected individuals and communities. Mold is at a crisis level. Residents will not receive FEMA aid to pay for the mold remediation necessary to make their properties even temporarily livable. It is pretty remarkable to see an essay like this one in an academic journal, even one as broad and literary as Public Culture. 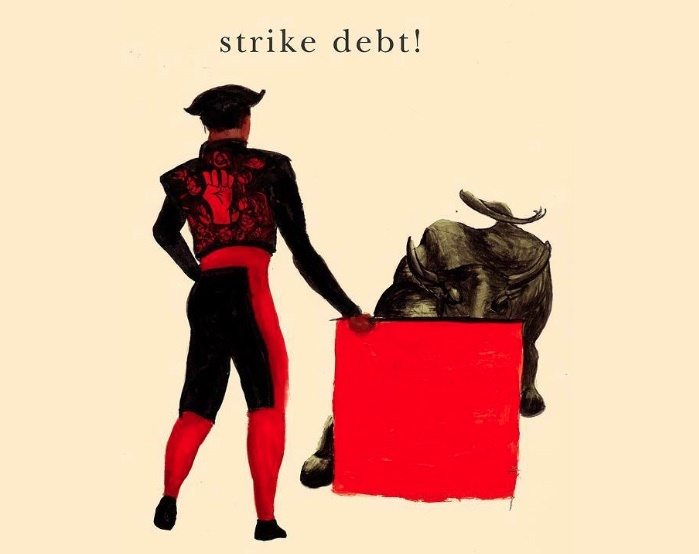 NYC Event, Nov. 15: Abolish Debt! Want to give $25 to help abolish $500 of someone else’s debt? I received a pleasant surprise today when I opened my “Google Alert” (which lets me know when my name appears somewhere online): I learned that author and Harper’s editor Jeff Sharlet includes my essay, “Mic Checked,” on a syllabus for a writing course he teaches at Dartmouth. I’m there alongside Joan Didion’s Slouching Toward Bethlehem and James Baldwin’s “Down at the Cross.” OMG!